Chicago, Chicago, Chicago!! This great city offers tourists and locals so many different things to do. From inner city adventures to hitting the beaches of Lake Michigan, the Windy City has a rich history and lifestyle offerings. 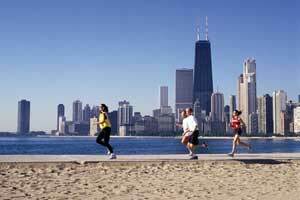 Chicago also offers several amazing safe places to run; the best of which are listed here! Lakefront Walk: Located on the shore of Lake Michigan and extending over 18 miles of beautiful lake shore views. Simply amazing!! Grant Park: A 319-acre park located near Downtown Lakefront. Full of unique architecture and distinct urban landscapes, the four mile running path offers spectacular views of the downtown skyline. A must do! The Loop: Located in the heart of downtown Chicago. The three-and-a-half mile loop is bordered by the Chicago River and Lake Michigan. It offers beautiful views of the Sears Tower, small shops and restaurants, and museums. Perfect for those who are visiting the Chicago area. See Matt’s entire tour of the Best Places to Run.